If you like plenty of action and characters that you care about and want to root for, you’ll love Gunners of the White Cliffs. When you finish, you’ll want to pick up Book II and keep reading. 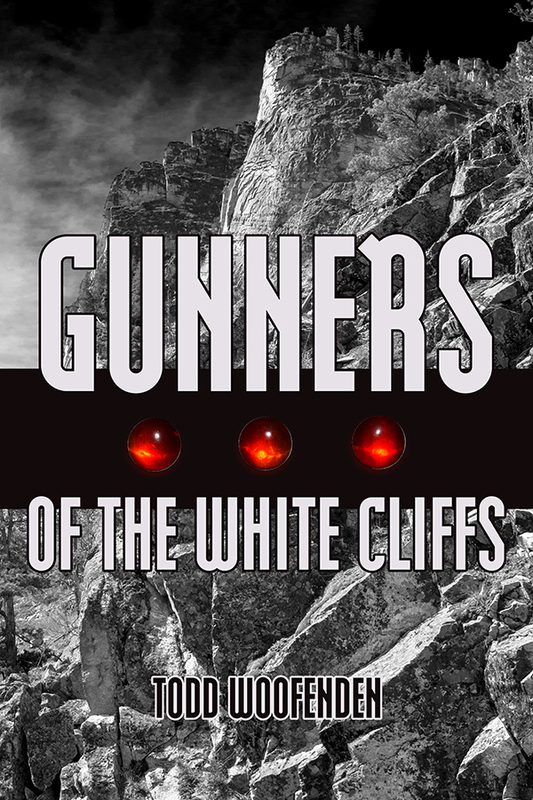 Gunners of the White Cliffs is the first book of the exciting action thriller / suspense series, The Gunners Trilogy: A tracker hunts a new type of assassin in the present, and a knife fighter tries to protect the villages around him from hostile incursions in the distant future. The tracker finds that the assassin's attention has turned to a peculiar young woman who can decipher complex patterns. And the knife fighter, hiding in solitude in a mountain pass, is jolted into action when enemy kill squads chase a pair of strangers to his doorstep. The dual time frame sets a tense theme of connections among the characters and across time. From his resting place in a cavern beneath the cliffs, a hunter armed with twin ten-inch double-edged blades hears guard transports approaching, rumbling up the road drawn by teams of the finest horses of the southlands, carrying kill squads with cutter guns. Rushing out onto the terraces above the road, he comes across two girls running from the guards, inexplicably still alive. A pair of southern strays has not only crossed the borderlands, but has made it all the way up into the passes. A tracker known for his ability to find high-value government targets swears off the work when a job goes badly and his handler is killed. But when the killer escapes from prison and assassinates a government advisor near the tracker’s summer lodge, he is drawn back into the hunt. Just as the hunt is getting under way for a second time, a girl who becomes mesmerized by the patterns of things around her is drawn into the pattern herself. Is she the target this time? "Gunners of the White Cliffs has all the elements of a perfect summer read, with the bonus of incredibly good writing. This is a tale of suspense, romance, and adventure, with a little sci-fi mixed in. It’s imaginative, intelligent, and, while partly taking place in a future world, totally relevant to today. Unlike your average thriller, the characters are well developed, and unusual, giving the story an added layer of intrigue. Two parallel storylines are equally engaging, believable, and well thought out." "From the beginning I was engaged and curious as to what would happen next. The parallel plot lines, one in a present-day setting and the other set in a post-apocalyptic time, have fascinating threads connecting them as they follow two gifted young women who find themselves navigating through situations fraught with danger and intrigue. ... It moves along at a good pace, with enough description to make one feel as if one is there with the characters, but not so much as to slow down the action. ... Gunners of the White Cliffs is engrossing and entertaining, and exceptionally well-written. I recommend it!" ... What remarkable imagination: characters beautifully drawn, seemingly normal, but with strange and powerful gifts; one story taking place in a dark mysterious series of caves, and rooms with contrastingly elegant furnishings ... Adventures happen one after the other, from plane crashes in the present day to villains in some future time pursuing innocent young girls armed with only their wits ... and a reluctant friend. Both stories have satisfactory endings, but there is so much more to tell; this reader is looking forward to books two and three. Kudos, Mr. Woofenden!